On August 5th, 2016, Mary Bowen stepped down from her position as Media Resources Assistant here at Krasker Film/Video Services, a role she excelled in for over eight years. Mary earned her MFA in Film Studies from Boston University in 2005, and after a stint teaching writing and communications in Massachusetts and Pennsylvania, returned to the University in 2008. Mary was a valuable member of the staff, tracking down the most obscure titles for faculty to use in their classes and drawing on her considerable film knowledge to aid both faculty and students with research. She was also instrumental in launching Kanopy, our online film streaming service, and could always be counted on to walk patrons though the process of searching for titles, making clips and creating playlists. Our resident “Miss Kanopy,” Mary also represented Krasker Film/Video Services at this past spring’s IS&T Tech Fair, demonstrating the Kanopy streaming platform for faculty, staff and students. She was an excellent Krasker ambassador to all visitors to our facility, as well as a knowledgeable and helpful manager to our work-study students. Mary was also the main voice of our little blog Krasker Talks! since its inception. Outside of her work at BU, Mary is a creative writer and freelance journalist whose film criticism has frequently appeared in Cineaste Magazine. We are sad to see her go and wish her the best of luck on her future endeavors. Who would you say is Hollywood’s most prolific actress? Who would you guess has appeared in the most motion pictures over the course of their career? A Golden Age star such as Bette Davis or Joan Crawford? One of the young talents who seem to be in almost every new film coming out? The answer may surprise you … but to get to that answer, we have to go back — far, far back. Let’s start at 1919, although our journey will go further back still. 1919 saw the founding of Columbia Pictures in Hollywood, which was originally called Cohn-Brandt-Cohn Film Sales after its founders, brothers Harry and Jack Cohn and their partner Joe Brandt. The name never really stuck with the public and in 1924 the Cohns changed the name to Columbia Studios, after the female personification of the United States of America (seen at left in this World War I poster). Early Americans were familiar with this image of “Lady America” as she was represented in many paintings and newspaper editorial cartoons. She was eventually supplanted as the image of America in the 1920s with the growing popularity and appeal of the Statue of Liberty. The Cohn brothers wanted that same instant recognition for their films and had the studio artists design “their” Columbia with Lady Liberty’s torch (seen below in their 1934 logo). This logo was used up to 1976, when it went through a number of variations, due to a number of different corporations (including Coca-Cola) becoming partners with the studio. For a while the Torch Lady was gone entirely, to be replaced by just the expanding rays from her torch. That all changed in 1992, when the studio (which was now a subsidiary of Sony Pictures Entertainment) decided to go back to the classic logo, but reinvented for the new era. They chose New Orleans artist Michael Deas to create an image for the ages and the one that is still known today. “From the land beyond beyond… from the world past hope and fear… I bid you Genie, now appear” (The 7th Voyage of Sinbad, 1958). 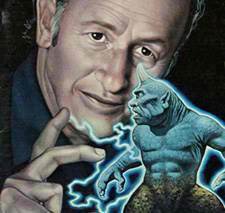 The quote above comes from one of Ray Harryhausen’s most famous films, but it could also have been spoken at his birth, for this cinematic special effects genius would infuse all of the films he worked on with a special brand of magic – and one that would pay dividends beyond even his imagining by inspiring leagues of filmmakers and technicians to follow in his footsteps and make a career in movie special effects their own. Raymond Frederick Harryhausen was born on June 29th, 1920 to Martha and Fred Harryhausen in Los Angeles, CA. From an early age (like many boys) he was fascinated with dinosaurs and would spend many hours at the Los Angeles Natural History Museum studying the murals of prehistoric life by artist Charles R. Knight (an example of which is seen below). Unlike many boys, however, he had a hobby of making his own dinosaur models and filming them in the garage of his parent’s home. During World War II, Harryhausen worked with director Frank Capra and his film unit, using his knowledge of stop-motion animation to create instructional films for the GI’s (such as How to Bridge a Gorge, 1942). At the end of the war, Harryhausen resumed his connection with O’Brien, who offered him an animation job on his next project, 1949’s MIGHTY JOE YOUNG. 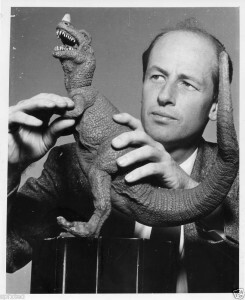 By his own estimates, Harryhausen said later that he was responsible for approximately 85% of the animation of the film, which was an excellent training ground for what was to come. By now, Harryhausen had gained a reputation for working quickly and inexpensively and was approached by Warner Brothers to make a dinosaur movie for them (after being turned down by O’Brien, who wanted more money for the effects than they were willing to pay – he then recommended Harryhausen). Based on childhood friend Ray Bradbury’s short story (“The Foghorn”) that had appeared in THE SATURDAY EVENING POST magazine, it was fleshed out to feature-length and became the sleeper hit of 1953, THE BEAST FROM 20,000 FATHOMS. 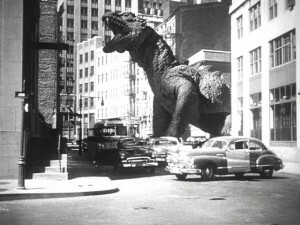 Other signature low-budget Harryhausen films followed in its wake throughout the 1950’s, including IT CAME FROM BENEATH THE SEA (1955), EARTH VS. THE FLYING SAUCERS (1956) and 20 MILLION MILES TO EARTH (1957). 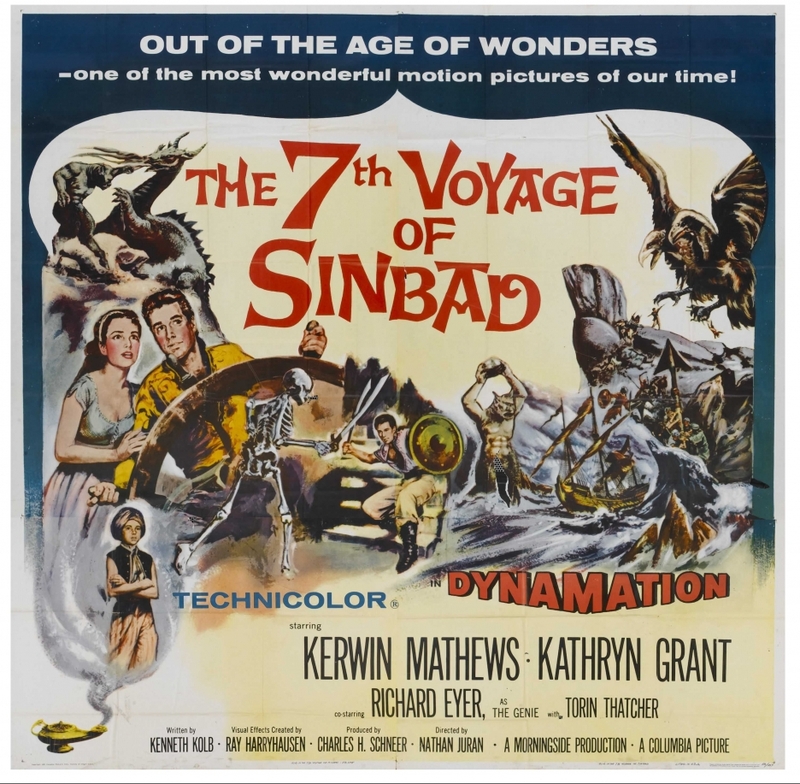 In 1958, Harryhausen’s star would rise immeasurably with the release of THE 7th VOYAGE OF SINBAD. His producer and collaborating partner Charles H. Schneer had convinced him this was the film to shoot in Technicolor (which Harryhausen had resisted with his earlier films due to the additional problems color presented for animation). Schneer’s instincts were spot-on and 7th VOYAGE became one of the top box-office hits of the year. From the opening sequence with the Cyclops on the island of Colossa to the fight to the death with a sword-wielding skeleton, the film presented an astonishing display of Harryhausen’s perfected stop-motion technique – the marriage of his animated models to live action actors, all shot in Technicolor and scored by the maestro of film composing Bernard Herrmann. 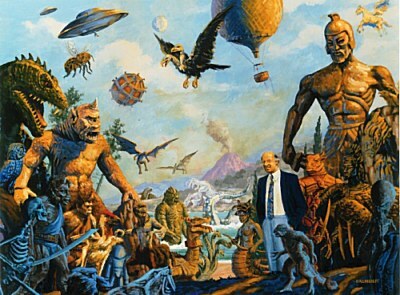 With the success of 7th VOYAGE, Harryhausen embarked on a wondrous decade of work, bringing forth many of his best remembered and most cherished films, such as THE THREE WORLDS OF GULLIVER (1960), MYSTERIOUS ISLAND (1961) and my personal favorite of his films, JASON AND THE ARGONAUTS (1963), which I have written about separately (see the following link: jason-and-argonauts-1963-shown-june.html). The latter half of the decade would bring more wonders from the fertile imagination of Harryhausen, including FIRST MEN IN THE MOON (1964), ONE MILLION YEARS B.C. (1966) and THE VALLEY OF GWANGI (1969). 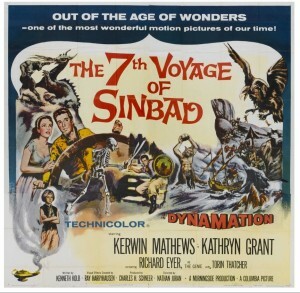 All of the films were well-made and technically proficient, but none made the kind of money 7th VOYAGE had (with the exception of ONE MILLION YEARS B.C., and the argument can [and has] been made that a good part of that was due to Raquel Welch’s ‘assets’ in the film – indeed, a poster of her character in the movie was one of the best-selling posters of the 1960’s). Audience taste had changed and it seemed nothing that Harryhausen and Scheer offered to the viewing public was to their liking. Discouraged but not giving up, Schneer suggested a return visit to an old friend. 1974 would bring about a much-heralded (and needed) renaissance to both men’s careers with THE GOLDEN VOYAGE OF SINBAD. More seamless animation, more amazing creatures (including a cyclopean centaur, a griffin and homunculi) and a showcase moment in the film, when Sinbad and his men battle a six-armed, scimitar-laden statue of Kali come to life (courtesy of the dark sorcery of the magician Koura, ably portrayed by Tom Baker before he began his historic run on television’s DOCTOR WHO). 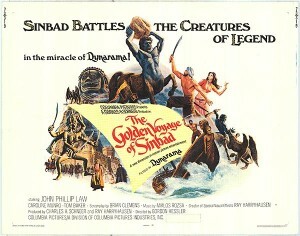 The film was a box-office smash and the team of Harryhausen and Schneer tried to make the third time a charm with 1977’s SINBAD AND THE EYE OF THE TIGER, but the audience was having none of it, instead giving their allegiance that summer to a little film that went by the name of STAR WARS. Times were changing and the way films were being made was changing, as well. Harryhausen’s films were always an occasion to be welcomed, as they were few and far between. The very nature of his job contributed to that factor, as he was a one-man operation for most of his career. With the dawning of the 1980’s, however, his method of animation was being eclipsed by a new, faster and (eventually) cheaper process, Computer Generated Imagery, or CGI. It is the preferred choice of film technicians everywhere today and there are whole companies devoted to it, but it lacks the one thing that was always present in Harryhausen’s films … the human touch. More on this point in a moment. Harryhausen’s final feature would come in 1981. 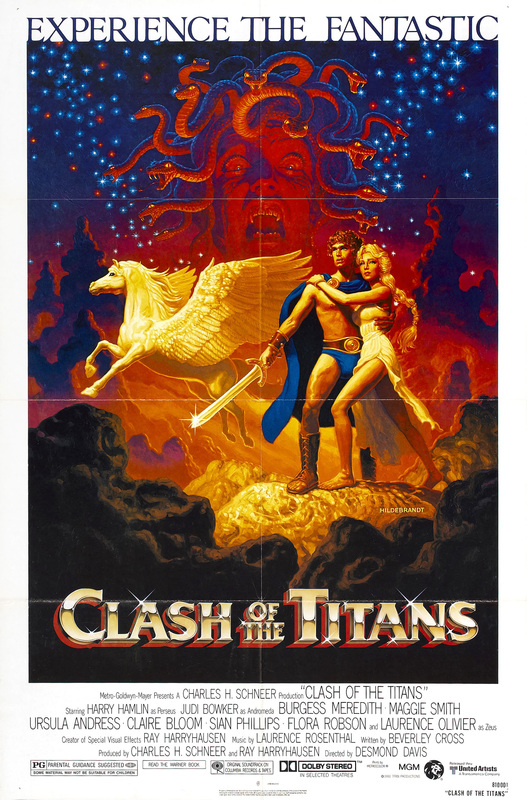 CLASH OF THE TITANS would be all new: new studio, the biggest budget of any of his films, an all-star cast (including Sir Laurence Olivier as Zeus) and a return to one of his favorite topics: Greek mythology. It would also be the first time he would share the major animation duties (in order to make MGM’s targeted release date), calling upon fellow animators Jim Danforth and Steven Archer to assist. He would save one sequence for himself to mark the capstone to his animation career – the fateful battle between Perseus and Medusa in her temple. 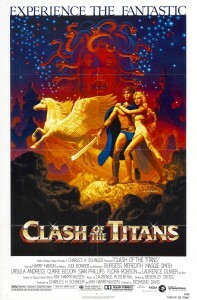 An atmospheric and suspenseful scene, it is the highlight of the film, with Perseus and his men going from hunters to hunted and being calcified by the Medusa’s gaze one by one. Harryhausen’s design for the Medusa is a triumph as well: half-woman, half-snake – a slithering nightmare with a quiver of arrows to distract you and a deadly stare to send you instantly into eternity. The film boasts other wonders, too – from the magnificent Kraken to the beautifully rendered Pegasus, and the assorted giant scorpions, vultures, two-headed dogs and Athena’s mechanical owl Bubo. CLASH was a feast for the eyes and one of the best films of the summer of 1981. With the completion of the film, Harryhausen announced his retirement and spent his remaining years writing, sculpting, attending conventions and doing commentary tracks for DVDs, both for his own films and others (including KING KONG, the 1935 version of SHE, etc.) – he was always a welcome guest at many animation studios and film sets, usually bringing all work to a halt as everyone wanted to meet him and tell their stories! At Industrial Light and Magic, they have a permanent bronze statue of Ray and the skeleton from 7th VOYAGE (seen at right). His legacy continues to live on. The above is only an overview of Harryhausen’s career. There are a number of books available that cover every facet of his films, ranging from Harryhausen’s own books (including his oft-updated Film Fantasy Scrapbook) to the exhaustive three-volume set “Ray Harryhausen: Master of the Magicks” by Mike Hankin. In addition, there are websites, magazines and documentaries on the man and his films (the best of which is director Gilles Penso’s 2011 film RAY HARRYHAUSEN: SPECIAL EFFECTS TITAN, which uncovers long-lost effects and test footage and shows how it all came together). In the documentary, Harryhausen is called “the godfather of special effects” – it is as good a name as any, but doesn’t really relate WHY he was so important to fantasy filmmaking. Part of the the reason is because he was making films no one else could make … and he was doing it alone. The painstaking detail required in stop-motion animation requires the patience of a saint, the memory of an elephant and the stamina of an athlete – all so some jointed models can move convincingly across a movie screen. Others tried to do what Harryhausen was doing, with limited degrees of success. The only other animator who came close was Jim Danforth (see his WHEN DINOSAURS RULED THE EARTH (1971)). The list of BAD stop-motion goes on and on – two examples of how NOT to put your finished product on the screen would be THE BEAST FROM HOLLOW MOUNTAIN (1956) and DINOSAURUS (1960). I was one of those young men back in the 1960’s and ’70’s who relished each of his new films, having discovered his artistry with a viewing of JASON AND THE ARGONAUTS. 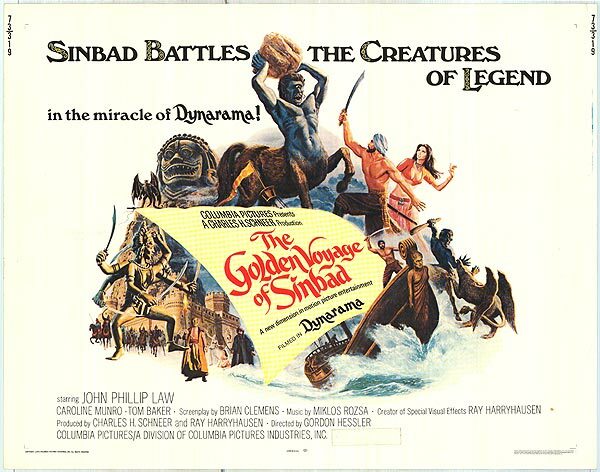 I vividly remember going with friends in 1974 to see THE GOLDEN VOYAGE OF SINBAD and being so awestruck by it that I immediately sat through a second showing! I also remember a violent storm passing through Minnesota in June of 1981 and the local paper showing the damage to the theater marquee due to high winds. The film on the demolished sign? CLASH OF THE TITANS. 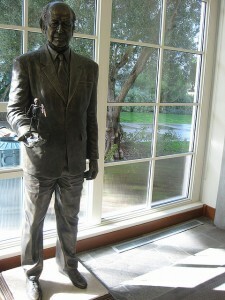 My fondest memory of Ray Harryhausen, however, was my chance to meet him and his wife Diana in 1990. I was volunteering as a projectionist for the FANEX film convention in Towson, Maryland, and Gary and Sue Svehla (the organizers of the show), knowing of my admiration for him, had arranged for me and my friend Mark to take them to lunch, to have time alone with them away from the convention. We both peppered him and his wife with questions (all of which I’m sure he had heard a thousand times before) and were able to get to know more about him and his films, if only briefly. I was surprised when he mentioned that Boston (my home city) was always a hard market for his films (not due to me, as I saw them many times when they arrived!) 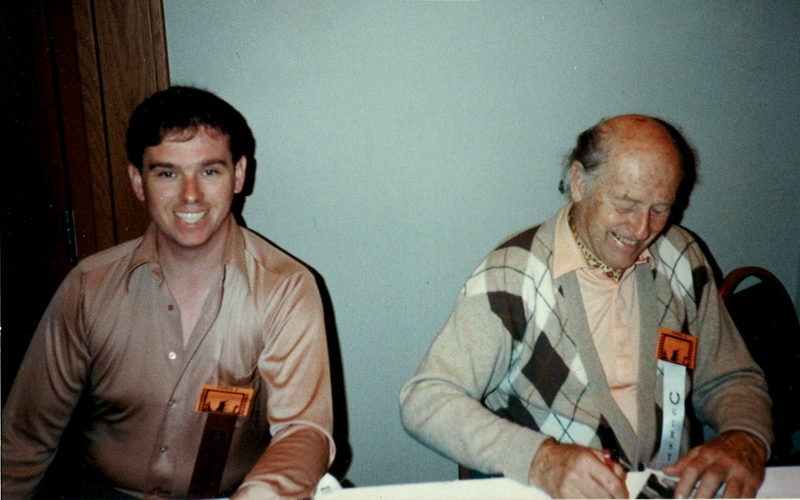 – it was a treasured time for both Mark and myself, and a bit of carpal tunnel syndrome for poor Mr. Harryhausen as both of his fans had plenty of items for him to autograph – the photo here is from that convention. 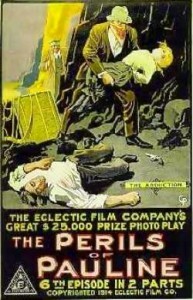 In the silent era, the most famous American serial star was Pearl White, star of THE PERILS OF PAULINE and many others. Dangling from cliffs, speeding to her doom in runaway cars or plummeting to certain death was all in a day’s work for Miss White. Forget Mary Pickford – many a red-blooded American girl (especially in the constricting society of the 1910s and ’20s) wanted to be Pearl White. Therein lied one of the major attractions of the serials: for 15 minutes each week, you could get lost in the fast-paced adventure unfolding on your local movie screen, full of brave heroes and heroines, dastardly villains and inescapable death traps … or were they? There was only one way to find out – come back next week! So with coin in hand, you would rush back to see how Pearl (or whoever) got out of her latest scrape. It usually involved a “cheat”, a crucial piece of footage not shown at the end of the previous chapter. You would groan and shake your head, but were willing to go along with the deception (and the continuing deception) for the next twelve to fifteen chapters, because it was so fun. Pearl was the most famous of silent heroines, but she was by no means the only one. Other notable scrappy serial stars included Helen Holmes and Ruth Roland, as well as lesser-known stars Kathlyn Williams, Mary Fuller and Norma Phillips. The silent chapterplays were heavily female oriented, coinciding with the Women’s Suffrage Movement and the first wave of feminism, but with the coming of sound and the expansion into new subjects, that would soon change. By the 1930s, the serial cliches were firmly set in place. The basic plot went something like this: hero/heroine (plus various comic relief sidekicks and red herrings) are on the trail of a treasure/invention that can be used for the good of humanity. Enter villain (who can be posing as one of the good guys/red herrings and is often hooded/masked/disguised) who will now Stop At Nothing to get his/her (yes, there were female villains, as well) hands on said treasure/invention (usually NOT for the good of humanity). As each death trap fails to kill off our stalwart heroes, the villain tries something even MORE outlandish until the final chapter, where he/she gets their final unmasking and comeuppance (and more often than not, meeting a horrible death at the hands of one of their own death traps). What was needed now was where to draw inspiration to keep the crowds coming back for more. 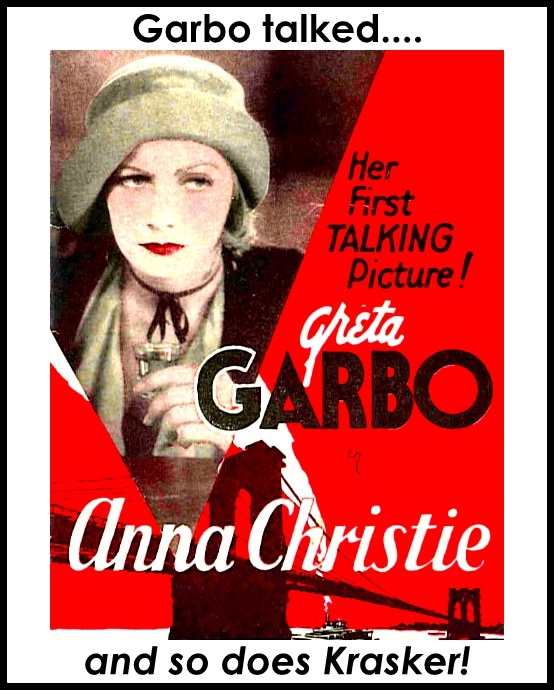 Hollywood, always on the lookout for the Next Big Thing, took their cue from what the public was following – in the 1930s, that was the radio thrillers, the pulp magazines and the Sunday Funnies. Tarzan, Tailspin Tommy, The Shadow, The Spider and more Western serials than you could roll a sagebrush at regularly made their rounds in America’s movie houses of this time. It wasn’t until 1936, however, that the chapterplays really hit paydirt. Those who worked in serials knew their core audience was mainly kids – they were the return customers who sweated it out every week to see how their hero escaped immolation, decapitation or worse. It was their hard-earned dimes that kept the movies going – especially during the Great Depression, when discretionary income of ANY kind was hard to come by. The studios knew what the kids wanted and who their most beloved heroes were, and so Universal gambled (and won big time) with Alex Raymond’s FLASH GORDON. This one had it all – spaceships, swordfights, dinosaurs, Hawkmen, Lion Men, Shark Men … and the best serial villain of them all, Ming the Merciless (played to perfection by Charles Middleton). 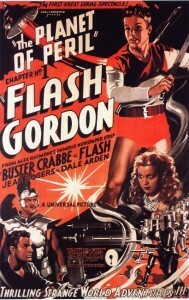 Olympic swimming champion Larry ‘Buster’ Crabbe won the role of Flash and was forever wedded to the role. The serial was so successful, it spawned two sequels (the only serial with that distinction). The serials thundered along into the 1940s, with every genre imaginable thrown up onto the screen. Like air battles? You could watch SKY RAIDERS, ADVENTURES OF THE FLYING CADETS, JUNIOR G-MEN OF THE AIR and more! Air travel make you sick? Prefer something at sea? There was SEA RAIDERS, THE HAUNTED HARBOR and DON WINSLOW OF THE NAVY to choose from. Keep in mind that America was now firmly embroiled in World War II, so Axis criminals abounded and saboteurs were running rampant! Ordinary heroes and superheroes had their hands full with the Nazi Menace and their cronies. From jungle adventures to spy thrillers, and from Mounties to Medieval heroes, the serials had their Golden Age during this era. Sadly, all good things must come to an end. The children of the ’30s and ’40s had grown up, the harsh realities of a Depression and a World War had eroded a lot of the magic of the movies, and with the dawning of the 1950s, a new threat emerged – one that the serials could not survive: television. Serials were always made on a low budget; with the changing times, growing costs and fewer return customers, the writing was on the wall. The last serials were made in 1956 and then it was all over. Those who could, made the leap to television – veterans like director William Witney and John English (who co-directed my personal favorite serial, 1941’s THE ADVENTURES OF CAPTAIN MARVEL) and actors like Buster Crabbe continued and flourished in the new medium. Ironically, television became the center of the rebirth of the serial, both literally and figuratively. In the early days of TV, network programmers were starved for content and took to showing a number of the old serials in their afternoon time-slots. It was a perfect match and the kids loved it: a chapter a day, Monday – Friday, with plenty of time to squeeze in the all-important commercials. Today? Take any given night on TV and look at the listings. Some of the most popular and highly rated shows are the serialized cliff-hanger dramas, the ones with a continuing “mythology” that people follow from week to week to find out what is going to happen to their favorite characters. A perfect example was the soap opera DALLAS. On March 21st, 1980, the season ended on a cliffhanger ending – and America demanded to know, “Who shot J.R. Ewing?” It was the highest-rated television episode in TV history at that time, and other shows quickly took notice. Many serialized shows (such as 24) now regularly end their season on a cliffhanger – following an honorable tradition that stretches back 100 years. Ah, the month of October! Summer is gone and there’s a brisk nip in the air giving you fair warning that Winter will soon be upon us – but before it arrives, we have Fall. That in-between time, too warm for Winter yet too cold for Summer, a time of changes, both seasonal and personal. The light clothes are put away and the sweaters come out. The nights get darker earlier and the houses are decorated – with every sort of ghoul and goblin imaginable. Why? Because Fall is also the time for Halloween. Forget Christmas – many a child will tell you that Halloween is REALLY their favorite holiday, that one special night they get to stay up late, get dressed in a costume and go door-to-door trick-or-treating for candy. I still recall a year I went out with my son and he went non-stop for three hours! It’s also the season to revisit old friends and family … but not the kind you’d invite to dinner. While Thanksgiving is the traditional family reunion time, I’ve always looked at Halloween as a time to revisit the cinematic aunts and uncles who made me the unabashed horror fan I am today. It’s a tradition I passed on to my son when he was young, and one I hope he continues. 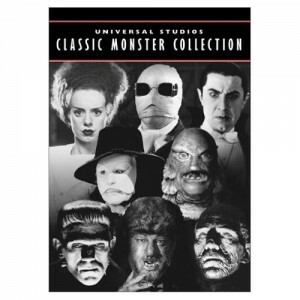 If you’re looking for something spooky to show to the young and/or timid of heart, may I recommend the Universal Studios Classic Monster Collection. An eight disc DVD boxed set, it’s a crash course in monster-dom; specifically the Old School monsters of Universal Studios. Are you a Twi-hard? Love the vamps of TRUE BLOOD or THE VAMPIRE DIARIES? Then check out their great-granddaddy Bela Lugosi in DRACULA (1931, 75 minutes). Originally released on Valentine’s Day in 1931, it was advertised as “the story of the strangest passion the world has ever known!” Director Tod Browning was no stranger to vampires, having directed Lon Chaney in the (long lost) LONDON AFTER MIDNIGHT in 1927. Sadly, seen today, his DRACULA is no better than a curiosity, almost filmed as if it were a stage play, with very little camera movement to bring it to life (as it were). That’s where the joy of the Special Edition DVD kicks in: on the same disc is the SPANISH edition of the film, shot on the same sets with a different cast and director (George Melford), and with a creeping feeling of terror the Lugosi version never masters. They are both eerie in their own ways, and make for a fascinating night of side-by-side comparisons. Vampires leave you cold? How about something a little more … stitched-up? Then you need to check out director James Whale’s one-two punch of FRANKENSTEIN (1931, 71 min.) and BRIDE OF FRANKENSTEIN (1935, 75 min.) – both with the gifted Boris Karloff. He was indelibly linked to the Frankenstein Monster his entire career, calling the character “my old friend”, and had an amazing gift for pathos under the heavy makeup and pounds of costuming. Even today, you still feel the creature’s plight, thrust into situations not of his making, wanting only love and companionship and shunned and attacked on all sides. If possible, see these with a young horror fan, who is just seeing them for the first time – it’s a revelation what the kids come up with. Karloff said many times that when children wrote him fan mail, they always understood and sympathized with his portrayal of the creature, and felt bad for him. BRIDE is a Hollywood rarity: a sequel better than the original. Both Karloff and Whale were familiar with and more assured in their roles, and it shows. The addition of Elsa Lanchester as the titular Bride, with her electric hairdo, remains a stunner today. If vampires and monsters are STILL too much for your timid audience, then start them out with 1933’s THE INVISIBLE MAN (71 min.) – another James Whale film, this time with Claude Rains in the (unseen) titular role, with ground-breaking special effects by John P. Fulton. 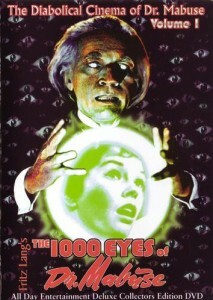 Of all the films so far discussed, this one was closest to it’s original source, the novel by H. G. Wells. DRACULA, although based on Bram Stoker’s novel, more resembles the stage play by Hamilton Deane and John L. Balderston, while FRANKENSTEIN and BRIDE were a mish-mash from all over, taking bits of Mary Shelley’s original novel and spreading it out over two films, along with play adaptations and original bits from Whale himself. THE INVISIBLE MAN sticks very closely to the novel, and thrilled audiences of the time, especially with Rains’ dramatic unveiling of … nothing … underneath his bandages, before going on his crime spree. We now turn to my personal favorite in the collection, 1932’s THE MUMMY (74 minutes). Another masterful performance by Boris Karloff under the brilliant (and daunting) makeup of Jack Pierce, THE MUMMY still brings chills today. I have written about the film before in greater detail, so rather than rehash it again, may I direct you here: mummy-january-1992.html. For those of you who prefer monsters of the more hirsute variety, there’s the 1941 production of THE WOLFMAN (70 minutes). Lon Chaney, Jr. portrayed the cursed Lawrence Talbot for the first time in this film which, like Karloff’s Frankenstein Monster, would become his signature character. Bitten by a werewolf at a gypsy camp (Bela Lugosi), Talbot is now eternally cursed with the affliction of lycanthropy and all it entails. His father, Sir John Talbot (Claude Rains), believes none of this, eventually killing his own son with his silver-headed cane … until the next sequel. Of all the films in this set, I think this one has the most quotable lines (courtesy of writer Curt Siodmak), such as my favorite, “Even a man who is pure in heart and says his prayers by night, may become a wolf when the wolfbane blooms and the autumn moon is bright.” The film still holds up well today and was the basis of a criminally ignored remake in 2010 starrring Benicio Del Toro in the Lawrence Talbot role. The weakest link in the set is provided by 1943’s PHANTOM OF THE OPERA (93 minutes). 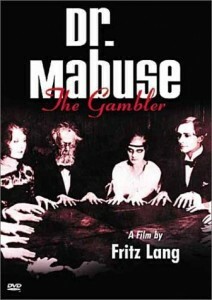 Supposedly a remake of the 1925 Lon Chaney version, this Technicolor extravaganza forgets who the story is supposed to be about, concentrating more on the opera performers (Nelson Eddy and Susanna Foster) than the Phantom himself (Claude Rains) – ironically, by shifting the mood away from horror to romance, it predates the Andrew Lloyd Webber musical version, which was one of his most enduring successes. The film is still worth seeing, but you would be better served tracking down the original silent Chaney version to see the story done properly. 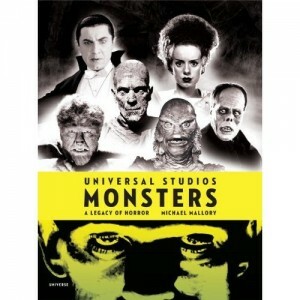 Finally, if you have any interest in or love for the old Universal Horrors as I do, it would be remiss of me to end this article without mentioning a book from 2009, Michael Mallory’s Universal Studios Monsters: A legacy of Horror. Filled with stories and anecdotes about the films mentioned above and more, by the people who made them, this is an AMAZING oversized book, crammed with detail and behind-the-scenes photos, many of which I’ve never seen published before. 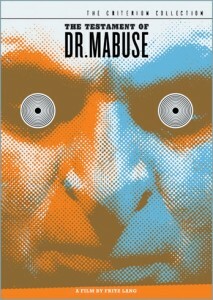 It’s a perfect complement to the DVD set for the horror fan in your life. So when the pumpkins have all been carved and the trick-or-treaters have all been served, sit down and turn off the lights and get to know your Halloween family all over again – you’ll be glad you did.